8 persons Servings ~ 1 hour approx. Heat the oil and butter in a large, lidded casserole on the hob, then add the onions and a pinch of salt. Cook for 15-20 mins on low heat until soft and golden. Add the paste and peppers, then cook for 5 mins more to cook out the rawness of the spices. Add the chicken and stir well to coat in the paste. Cook for 2 mins, then tip in the tomatoes, purée and 200ml water. Cover with a lid and gently simmer for 15 mins, stirring occasionally, until the chicken is cooked through. Remove the lid, stir through the mango chutney, cream and yogurt, then gently warm through and season. 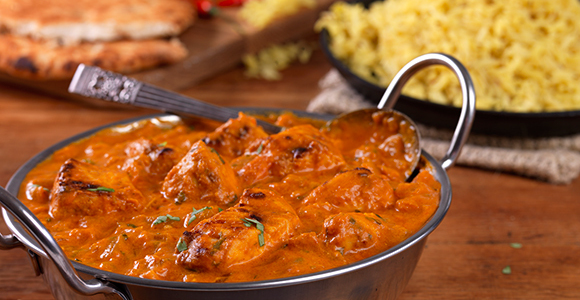 Sprinkle with coriander leaves and serve with basmati rice and naan bread. In a small food processor, blitz together 5 garlic cloves, 1 large knob of fresh root ginger, roughly chopped, 1 red chilli, deseeded and roughly chopped, 2 tsp each ground cumin and coriander, 1 tsp each turmeric, paprika and garam masala, and the seeds from 4 cardamom pods. Add a little water or vegetable oil to bring the paste together. Can be stored in the fridge for up to 1 week or frozen for up to 1 month.